We'll have winners announced for the one-skein pattern contest by the middle of this week. Some unexpected travel has interfered with knitting and blogging for the next few days. I'll leave you with this post until I get back. This is my favorite new, quick knit. Possibly my favorite quick knit of all time. 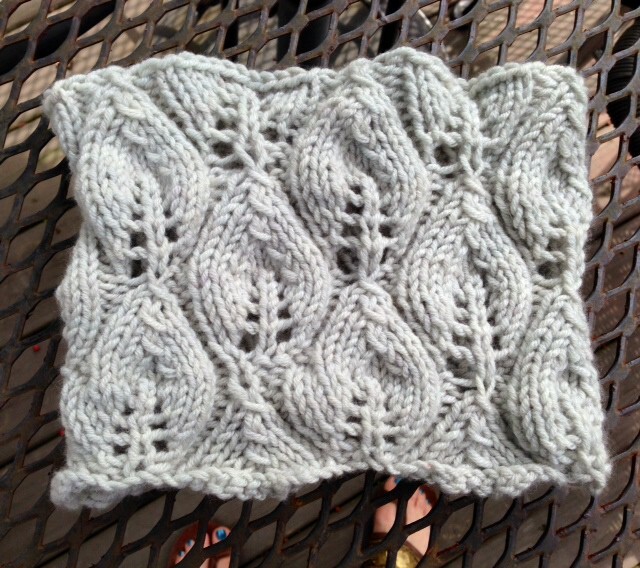 It is Saccade Elyse's Golden Tulip Cowl. I'm a slow knitter, but as you can tell from the cast on post for this project, just a few days ago, it took only a few pleasant hours to knit up this cowl in aran weight yarn. And, it's a pattern you can feel good about purchasing, as she asks for a donation to an Epilepsy charity instead of payment. I'm planning on knitting several of these cowls as presents. Surprisingly, my 11 year old son has asked for one. Despite the hot, humid Alabama sun this afternoon, he put it on and wouldn't take it off. So he's next up. A word about the yarn. I used it because I wanted to knit something from the black bean-dyed yarns I've been sharing with you all. The results are good so far. This yarn is light and color fast and incredibly soft. In fact, this pattern just begs to be knit in cashmere, a silk blend, or something equally soft and drapey. So go for it. I used a traditional cast off, but am going to go back and redo it, as it's looser than the cast on edge. I'll substitute my friend Helen's favorite stretchy bind off, which is k1, *k1, slipt the two stitches on the right hand needle back to the left hand needles, k2tog through the back loop*, repeat from *. This should produce a nicer, more finished edge.